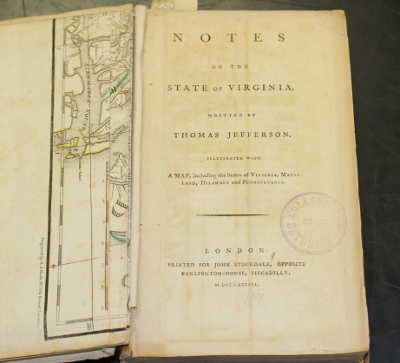 This 1787 edition of Notes on the state of Virginia by Thomas Jefferson is currently held together by black book tape and needs to be rebound. 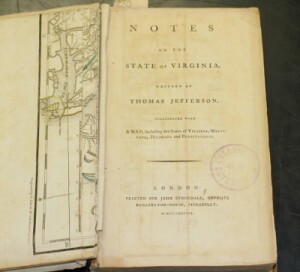 The book’s text block (book pages and inner binding) are intact but no longer attached to its front and back covers, the included map of Virginia and neighboring states also has some minor damage. 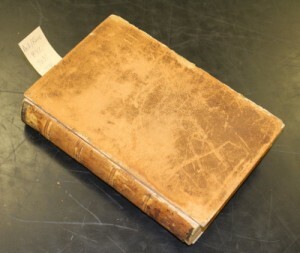 This edition is one of the rare volumes published by Jefferson during his lifetime. 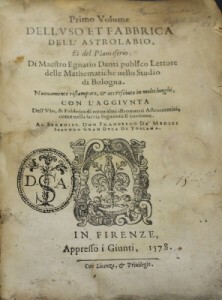 This rare 1578 volume by Ignazio Danti is one of the first Italian works that centers on astromony and the use of the astrolabe. 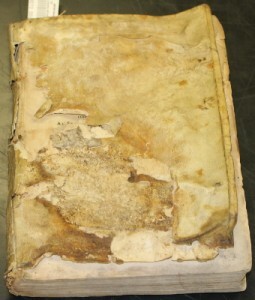 The highly damaged cover and spin are made from vellum and needs to be conserved or replaced. 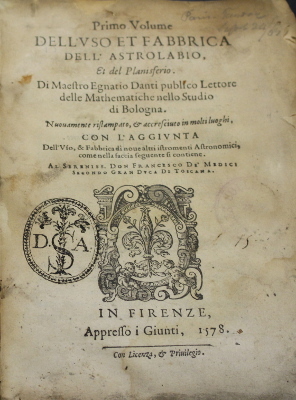 The book has also survived previous water damage and the staining is visible throughout. 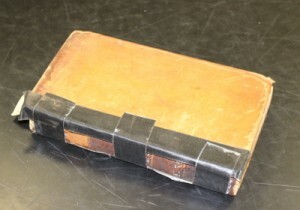 Another prevalent issue in rare book collections is ‘red rot,’ which is the degradation process of leather. If stored in the improper conditions the leather can degrade and weaken, producing a powder-like residue which transfers to other books, crumbles onto shelving and generally gets everywhere. The damage is irreversible, but can be somewhat stabilized through conservation. This example is an 1860 edition of the History of the religious Society of Friends by Samuel Janney. If you are interested in helping the University preserve these irreplaceable works, please consider donating to the Friends of the Archive Fund, contact Director Kate Dodds for more information. Next Next post: We Want Willkie!! !